"What if you could reach back in time? What if it changed everything?" The year is 1999 and John Sullivan, a young New York police detective, receives a ham radio message from a local fireman during a period of unusual sunspot activity. As the two talk John (James Caviezel) soon realizes the fireman is his own father, Frank Sullivan (Dennis Quaid) in 1969, just prior to his father's accidental death in a warehouse fire. Desperate to change the past, John tries to warn his father of his impending death. Not sure whether to believe the message or not, Frank is faced with a grim choice when he is called to the fire as foretold by his son. Trust his instincts and face a certain death according to his son, or betray his instincts and pray the message he received is genuine. At the last minute, Frank decides to trust his son, and is miraculously delivered from certain death. While John has succeeded in altering the past, he has unwittingly unleashed a new series of events stemming from his intervention. Among them a series of unsolved murders that has also claimed the life of John's mother. Racing against time John works to help his father through their ham radio conversations identify the serial killer and save his mother, John discovers that with each alteration of the past, his own future is susceptible to change. An interesting mix of action, mystery, and sci-fi with a sentimental father-son relationship story thrown in for good measure, I found Frequency to deliver on most levels. While some people are certain to accuse Frequency of being all over the map, I thought its blend of genres promised everyone would go away enjoying it for one reason or another. As with any Time Travel movie, there is a risk of confusing the audience with the twists and turns. 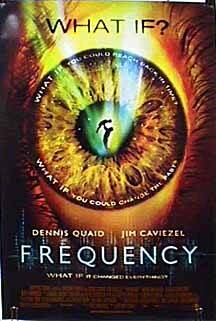 Frequency tends to take a slow deliberate approach in explaining the time travel aspects of the story for the most part. In fact the story seems to take an excruciating long time establishing the premise that Frank and John are communicating across time via the HAM radio when I think its obvious to most of the audience from the outset. Perhaps even more so to anyone who has seen the movie trailer or the television commercials promoting the movie. The fact that there is no physical travel to the past makes for an interesting take on the theme of time travel. While it seemed strange at first having things in the past suddenly change the reality of the present it actually makes sense logically. For example at one point in the movie Frank Sullivan (Dennis Quaid) burns a message into the wooden desktop only to have it appear in his son John's present as it happens. Unlike other time travel movies where the time traveller only notices the changes to his own time after he's returned from the past, John Sullivan is observing the effects of his intervention as they happen. By way of analogy, imagine John Sullivan tossing stone into a pond, the tossing of stone is his intervention in the past, the ripples that spread out from the impact of the stone eventually reach him on the shore or his present. As with other time travel movies, such as Back to the Future (1985), the photograph becomes the medium by which the audience is kept informed of the consequences of changing the past. In the case of Back to the Future (1985) it was the slow fade of Marty McFly's family from the photograph that let us know that his own present was in danger of being erased since had prevented his parents from meeting. In the case of the movie Frequency , John Sullivan's graduation photo and family photo become the benchmarks by which we know the how the intervention in the past has affected the present as people in the photographs appear and disappear accordingly to the shifting timelines. It isn't until the climax of the movie when the actions of the past have an immediate affect on the present does the effect get overwhelming for the audience to follow. Perhaps my biggest criticism of the movie is the character of John Sullivan as played by Jim Caviezel. Not only is the character a complete 90's cliché of burnt out cop with bad relationships and messed up personal life, the error is compounded by casting Caviezel in the role. At one point its stated that John Sullivan is supposed to be 36, yet Caviezel is barely able to convince the average viewer he is in his mid-20's. I know I've quizzed my friends and family on how old they think John Sullivan is based on the commercials. Just for the record Caviezel is actually born in 1968 which would make him about 31 at the time this film was made. Either way I felt his casting detracted from my overall enjoyment of the film since the age of the character came up more than once. I also felt that the conversations between father and son across time also fell a little flat. After John saves his father in 1969, Frank wanted to know about his son and how he grew up. I found this kind of strange since Frank would live to see his son grow up now and all of this was pointless. Not once did John ask Frank if he rather not reveal some information so that Frank could appreciate the surprise of learning first hand what the future would bring for them and their family. While the science behind the time travel in this movie is a bit circumspect as it is explained in the movie, there is a much better explanation on the official movie web site www.frequencymovie.com under the "Fact or Fiction" section. On a related note, I remember when I was younger reading or hearing an interview with a prominent scientist on the possibility of time travel. The scientist didn't know if it would be possible or not, but felt that if time travel was ever discovered that it would be a long time before they managed to perfect a machine to send a person through time. He felt that it was much more likely that if time travel were possible we would be able to communicate through time or send inanimate objects. An interesting concept seemingly echoed by this movie. The time travel aspects of the story, despite their flaws, made for an inventive script until the climax when they were completely thrown out the window for dramatic purposes. During the climax when Frank in 1969 encounters Shepard in his house and after a fight scares him off in the end, we cut to John in 1999 fighting Shepard off as well. At the very moment Shepard is about to kill John, his father Frank, who didn't die of cancer in 1989 as he had previously, rescues John. This makes no sense when examined objectively. When Shepard flees from Frank's house in 1969, Frank already knows his identity. It seems implausible that once Frank has this knowledge that Shepard would able to remain free until the present when he fights John. I kept expecting Shepard to vanish from the present once he had been thwarted in the past. While consistent with the established logic of the movie, it was apparently not dramatic enough. Despite this one glaring flaw, I highly recommend the movie to time travel enthusiasts and regular movie goers alike.